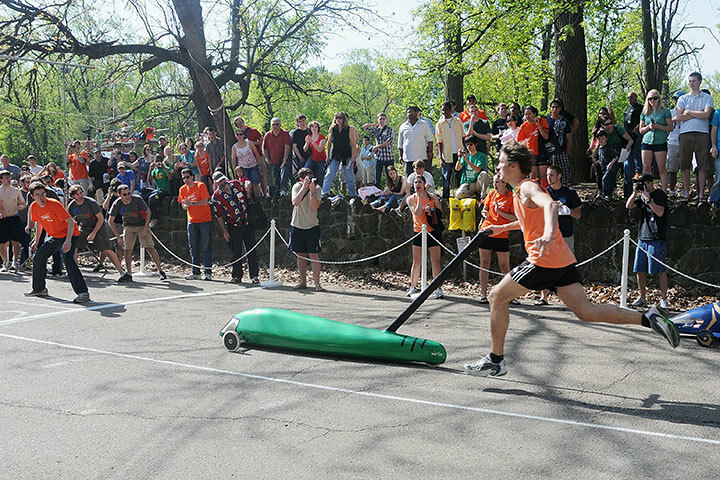 In what most would hope to be a time of friendly competitive spirit and a culmination of hard work paid off, the day of finals for Buggy races instead became a day of disappointment for the Student Dormitory Council’s (SDC) Buggy teams. 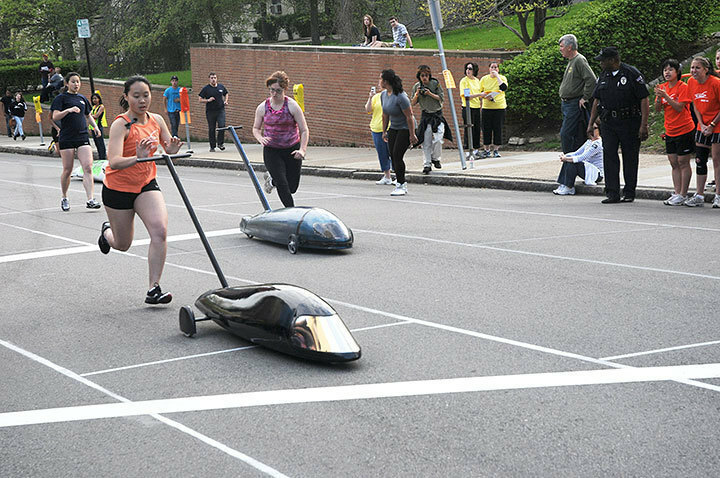 Last Saturday, all five of SDC’s men’s and women’s qualifying teams were disqualified due to a fire safety hazard near the group’s staging area. Going into the final day of racing, SDC was a dominant force on the leader board. Its women’s A team rolled the third-best time in the history of Buggy for women’s teams on Friday (2:28.14), and its B and C teams were in the top five spots as well. The men’s A team, which raced in the preliminary heats on Friday with a very fast time of 2:04.61, was in first place going into the finals, and its B team was in third place. Yet the rolls had not yet started Saturday before SDC got knocked out of the running. According to the report filed by fire marshal Robert Anderegg surveying the staging areas of all of the Buggy teams, SDC members took a propane tank out of their truck and carried it away from their staging area. While the team’s explanation was that the tank would be used to keep their pushers warm, its proximity to the staging area violated a fire safety rule set forth by Anderegg and the Sweepstakes governing body, and the organization was subsequently disqualified from racing in the finals. The fire marshal’s response to SDC’s outcry was that propane tanks are not allowed at all in or in close proximity to a team’s staging area, since the gas will find a way to ignite itself if allowed to escape from the tank. The tank’s presence was viewed by the head judge and the Sweepstakes Committee as a direct violation of the official Carnegie Mellon Sweepstakes rules and regulations, which state “NO quantity of ANY combustible liquid is permitted in or near the buggy preparation areas,” a condition that warranted SDC’s disqualification. There is no clear definition or set distance, however, of what constitutes “near” the Buggy staging area. The violation was immediately refuted by the team. According to Julian Kessler, SDC’s Buggy chairman, the propane tank was indeed present “near” the staging area, but was 20 feet up a hill from the buggy truck. Anderegg informed the Sweepstakes committee, however, that the tank was so close to the tent when he saw it in its initial position that it looked as though it had just emerged from the team’s staging area. Within minutes of the incident, SDC’s head members were approached by Thurston, Anderegg, head judge Andrew Hundt (SCS 2009), and adviser Kaycee Palko. After learning SDC’s side of the story, including their explanation about the origins and placement of the propane tank, the committee upheld the fire marshal’s disqualification of SDC, as SDC was present at the fire safety meeting and signed an acknowledgment of the Sweepstakes bylaws and their consequences. According to Thurston, such decisions are made jointly by the chairman, adviser, and the year’s head judge. Decisions are then enforced by the head judge. With three women’s teams and two men’s teams taken out, the opportunity was there for Fringe A to take home the trophy for both the men’s and women’s races, which they did. The Sigma Phi Epsilon men’s A team and Pi Kappa Alpha women’s A team took second. For the case of SDC, the official rules state that the maximum penalty such an offense is a 15-month suspension, the application of which is yet to be decided. In the 2009 Sweepstakes races, when Beta Theta Pi was found to have flammable liquid in a can inside its truck, the group was allowed to roll the next year under a strict probation. Editor's Note: Sara Wingen is a staffwriter for The Tartan, and Jessica Thurston is a Contributing Editor for The Tartan.